We’re all in the same types of boats. We all feel weird and insecure. Some have figured out the tools to overcome those feelings and press their way through to appear confident. Others don’t care, because their sense of self doesn’t revolve around the approval of others. I enjoy being around people but I need breaks. Similar to being away from people too long, where I feel that need to reach out to people draw in closer the less productive I’ve been, I also find myself needing to digest the chats I have with people by myself after one or two hours. It’s all about pushing forward. Chat more, do more, but also pace yourself. Don’t burn yourself in private by letting negative thoughts invade, or in public by sharing every intimacy of your rollercoaster ride. Let others guide the waves to safer shores. I grew up without self-confidence. People generally aren’t that bad. As kids, we could get away with being terrible, so long as no one was around. As adults, even if no one’s around, we can still learn to articulate how we felt based around what happened to try to mediate a long-term resolution. But that’s fixing it too late in the curve. It’s easier when you can solve these sorts of bullying problems before they happen. For me, I’m learning to better articulate where my boundaries are, and how we can have fun, so long as you don’t cross certain reasonable boundaries. We figure these out through conservations. When we talk to people, sometimes we can have that special conversation where we open up about feeling socially awkward. We can empathize and share our own journies through dealing with social awkwardness. Going to sobriety meetings is much the same way. I haven’t been to a meeting in years, partially because I realized that my addictions were more out of a place of self-loathing and negativity, so as long as I keep positive in some regard, I’ll be fine. And partially because we didn’t have much in common. My acquaintance group now is a nice place to hang out, have fun, mutually work on our own projects, and collaboratively brainstorm. 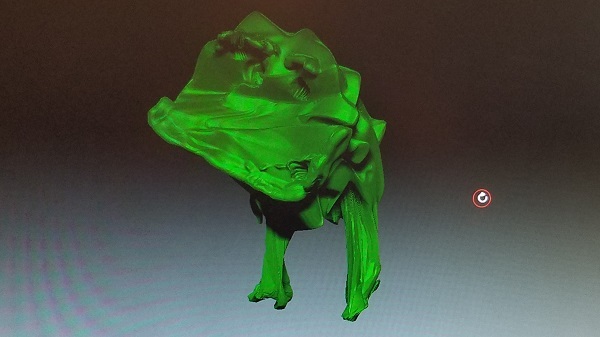 If I wanted to develop this weird 3D frog thing, I could. Or I can just have fun talking ta’ people. Quotes:  Me, then an acquaintance of mine. Inspirations: I took a few cracks at writing today but just didn’t feel like it. This series is always my decompression chamber for talking through some of these issues. In my case, I guess maybe I started the day thinking I could work, before realizing that I really did just want to hang out with others, probably causing my inner strife. Photo: I made a little thing in Zbrush and took a photo of the experiment. Didn’t save it.